Thanks for all your lovely comments on my last post! I had fun looking back at the things I made in 2011, but now I’ve already started looking ahead and working on some new projects for 2012. For my first quilt of 2012, I decided to go with January flowers – specifically these awesome retro vintagey florals which are part of Melody Miller’s latest line, Ruby Star Shining. I started by pairing them with a few other solids and prints from my stash – some Art Gallery solids, a bit of Essex linen, and even a little voile. Sometimes I start out knowing what type of pattern I want to use, and other times I start by just pulling out fabrics and then deciding on a pattern. I went with the latter this time, so after deciding on my fabrics, I browsed though my quilting Pinterest board. Once I saw this quilt by Denyse Schmidt on my pinboard, I knew these fabrics would be perfect. I usually like to switch up a design a bit, but I love this one just as it is, so I went with it. I’m not sure how Denyse put her quilt together, but I decided to go with foundation piecing for mine – it’s certainly not necessary, but I just find it easier to know what area I need to cover when I can use the paper as a guide. I used the floral Melody Miller print for the center of each block, then a couple of the lighter prints, ending with the darker purples. Unfortunately, as much as I loved the quilt top when it was finished, I’m not totally happy with how the quilting came out – I went with wavy, intersecting horizontal lines, which I like. I just had some trouble finding a thread color that would work on both the very dark purples as well as the lighter cream colors. [This has always been a dilemma for me – I’m not much for light thread on dark fabrics, or for dark thread on light fabrics – so what to do when you’re using both light and dark?!] Anyway, I did have to rip out quite a bit of stitching, then settled (though not totally happily) on this variegated thread for the purple sections, with cream thread for the lighter floral sections. It’s ok, but still not my favorite! But maybe I can overlook that when there’s a cute baby hiding underneath! Ruby Star Shining is available in many shops, including Sew Modern and Fabricworm, , where I have recently shopped to add to my Melody Miller stash! This entry was posted in [search] String Quilts, [search] Strip Quilts, [search] Wonky/Improv Quilts, Posts about Quilts, Quilts and tagged denyse schmidt, handmade, improv pieced, melody miller, quilt, quilting, ruby star shining, string, strip quilt. Bookmark the permalink. For what it’s worth, I love the stitching and the threads! I need to find a pattern for some of the lovely gray/yellow Dear Stella fabric I recently purchased; maybe something like this! Thanks for sharing. I think it is beautiful, quilting thread and all. You are being too hard on yourself. 🙂 But I agree, I have a hard time too when using light and dark fabrics…so I tend to just shy away from the combo altogether out of quilting fear. Way cute!!! I agree that some things, I just need to paper piece for accuracy. I like the quilting, a lot. And that binding choice is spectacular! Ashley I absolutely love this quilt. One of my favorites, for sure! This is a wonderful quilt and you have inspired me once again. The colors are so pretty. See it was the quilting that drew me to this quilt – I love the pattern you have used (I think it matches the design of the quilt perfectly) and I love love LOVE the variagated thread – it’s not something that has ever interested me before but now I want to use it – you, my girl, are just too bad for my bank balance!!! The quilting was the first thing I noticed on this quilt and I absolutely love it! I have to disagree with you! The thread color was the first thing I noticed about this quilt and I absolutely love it! It is perfect. Truly. To each her own, but I LOVE the way the quilting looks, especially that it shows up. I also tend to gravitate towards variegated threads for quilting. The crossing wavy lines is a great look! I think it is great! The thread works in the photograph. This quilt is fabulous. And the quilting caught my attention right away — in a good way! I love the variegated thread, and the wavy lines give the whole thing a more “painted” look, like rough brushstrokes. Great job! I love the colors, fabrics and design. I just “pinned” it! If it helps, I use mono filament thread in ‘smoke’ so you do see a tiny bit of the quilt thread but more the patterns that the actually quilting creates. It’s still a lovely quilt you have made. I love it including the quilting! It just looks like a very clever thought out design classic of a quilt! So lovely – I quite like the quilting and the contrasting threads. I think it adds an organic feel to the piece. I SO admire your work!!! I think the quilting is wonderful! It really adds to an already beautiful quilt! Interesting how people vary – because the first thing I thought looking at the pictures before the words was “I LOVE that quilting!”. Gorgeous quilt, way to start the New Year! I love your quilt – much nicer than DS’s version! Another gorgeous quilt – I also love using variegated thread when there is a mix of light and dark areas to quilt as it tends to blend into both better. I love the quilt AND the quilting. I have used invisible thread when I’m struggling with color and it works great. It shows the quilting pattern but no color. Oh, I want variegated thread now! Is your Guttermann? this one is by Sulky. I’ve used it several times now, and have liked it a lot! I think this is the next quilt I’d like to marry! Love every, single thing about it!! This is a beautiful quilt! I love the stitching… Looks great. I have the same dilemma you do when deciding what thread colors to go with for quilting. I love your binding choice, too! Of course, Max makes it even better! I really love the quilting on this quilt. I think it really complements the quilt. Now, I rarely leave anyone a comment so I must really like it. Wow, I love the quilting, in fact, as soon as I saw the quilt, I read through the post quickly until I got to the quilting part (then went back to read through properly :)!). Beautiful combination of fabrics; I’ve been eyeing her new line (love the type-writers)! I love those fabrics and that quilt. It looks so lovely. 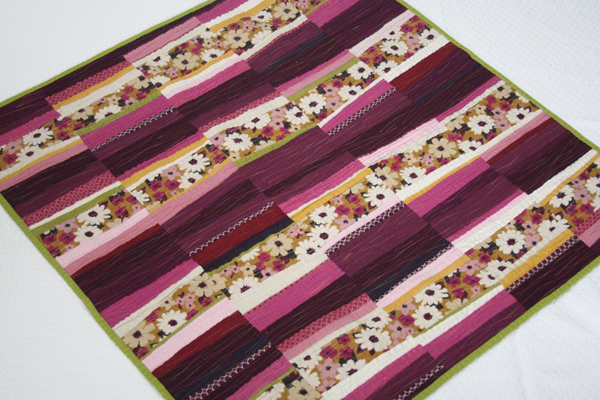 I LOVE the quilting, especially that you used that variegated thread! I know what you mean about the dilemma though, and I think it turned out great. I am definitely going to get some variegated thread. it looks beautiful to me. another gorgeous quilt. thanks for sharing. I LOVE, LOVE, LURVE this quilt! I love the colours and especially the quilting not to mention the variegated thread. I think it’s one of my favorites, must pin! A gorgeous quilt. Made cuter by the little one crawling under it. I like the way the quilting turned out, but I like light thread on dark fabrics, makes the quilt more interesting to look at. Nice job! I LOVE LOVE LOVE this quilt!! And I love the quilting too – thread colors also!! I was admiring that before I read the rest of your post 🙂 You are such an inspiration!! Love it. Before I read through your post my first thought was “I love the quilting on this quilt”.It adds beautiful texture to the solid fabrics. Love it, love it, love it. wow. i love this quilt! 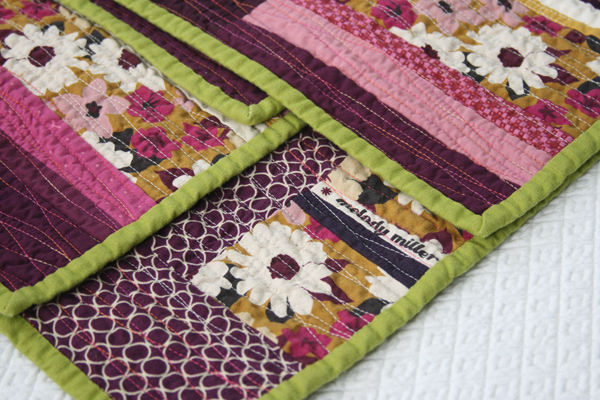 i love the colors, the simplicity of the pattern yet the great look….and the quilting! yes, cute little one underneath always makes it that much better! love your work! Love the quilt, lady! 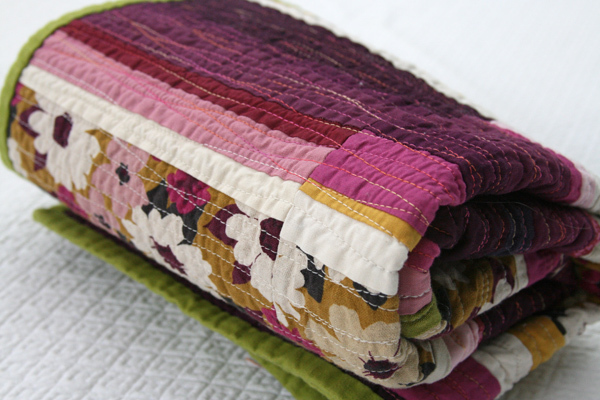 I’m all about some purple, and that green binding is a rockstar on that quilt. i think the quilting looks fantastic, when looking at the photos it almost looks like it’s a patterned fabric. It is really lovely, and great coloured fabric. Love how you made the fabrics work in this quilt, your amazing. Beautiful!!! Oh, my!! How can this not be your total favorite??? I love it so very much! Everything about it from the fabrics to the way you put it together to, yes, the color of stitching is perfect! I did a search for purple quilts last night on pinterest an came up with nothing that particularly spoke to me, but this quilt sings me love songs. I’m pinning it so the next one looking will find fabulous inspiriration! I’m joining the chorus of love for the quilting, any tips on how to quilt the wavy lines? What sewing machine foot did you use? I am terrified of anything but a straight line, but would love to try some wavy ones! Great job! I second this comment. I usually use straight line quilting because I’m comfortable with it, but would love to know how you did the wavy lines. I also usually struggle on which color to quilt with because I usually want to hide my quilting and show off the piecing, but after seeing this quilt I’m inspired to focus more on the quilting for awhile. That’s funny, besides the awesome design and color it was the quilting that first caught my eye on pinterest. I love these colors, Ash! I just wanted you to know that i have finally looked at all of the photos of your quilts. Stunning is the word that comes to mind. 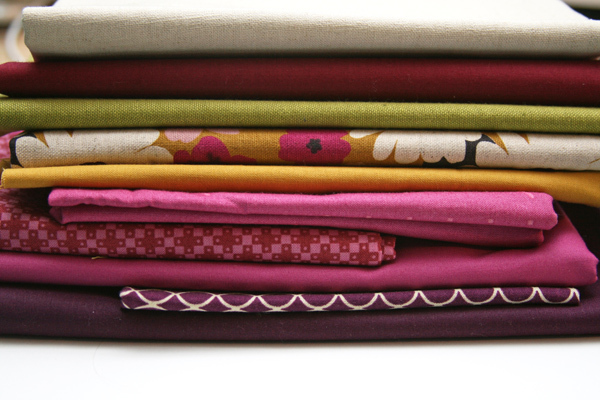 I just love your choice of fabrics and your quilting is fabulous. You have inspired me to try something new and different for me. Thank you so very much for you inspiration. I quite like the quilting. Which variegated Sulky thread do you use for quilting? LOVE this quilt. What is the plum-colored fabric with the circles?